I was born in Normandy, France. I am the eldest of 4 children (I have 2 brothers and a sister). We always moved around a lot when I was growing up. I must have lived in over 10 cities in my 26 years of age. I spent the most determining part of my life (age 10-17) in Reunion Island, a French tropical island located east of Madagascar, in the Indian Ocean. There, I spent all of my free time swimming in the outdoor pool and in the ocean, hiking, climbing, mountain biking, and playing roller hockey and all kinds of team sports. My parents have always been into sports (my dad is a cyclist and former basket ball player and cross-country runner, and my mom has been ice-skating and dancing all her life). Therefore, I was involved in sports from a very young age. 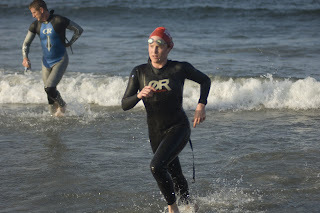 I have tried a lot of them but triathlon is the first sport that I have been so hooked on. Besides sports and outdoor activities, I have been fascinated by math and physics since the age of 11. After high school, I studied math and physics for two years before entering the National French School of Aeronautics and Aerospace Engineering, where I earned a master's in Aerospace Engineering. I am now finishing a PhD in Astrophysics at Boston University. My work focuses on star formation, on the spiral structure of the Milky Way (ed. Note: not the candybar), and on turbulence in the Inter-Stellar Medium. What is your pre-triathlon athletic background? I have been swimming all my life, although not always competitively. I can't remember a time when I have not been in the water at least once a week. Until age 20, I also played a lot of team sports (mainly soccer and basket-ball), which really contributed to my athletic background. I guess I have always been running around a lot. During the two years before I did my first triathlon, I participated in a lot of adventure races, which led me to triathlon. As a triathlete, what are your strengths and weaknesses? How did you improve? I started cycling relatively recently, about 3 years ago. Until the fall 2007, I was a slow cyclist compared to my abilities in the two other disciplines. I would usually lose ground on the bike during triathlons. I became frustrated about that, and worked really hard in the winter 2007/2008 and the following spring. I cranked up my volume of workout on the bike to about 10-12 h a week at high intensity. I went on 50+ mile rides both Saturday and Sunday of every weekend during this entire period. During the week, I also did three 1 h sessions on the trainer composed of 5-20 min intervals in zone 4. I was determined to reach a competitive level, so I also included one intense longish (13 mi), one fast 10 km and one easy 10 km runs in my training schedule, while maintaining the same swimming volume (5h/week). Now I have the same level in all three disciplines. My strength is not in one discipline in particular, it is rather my relentless determination. First, the feeling of freedom that triathlon provides. It is thrilling when I know that I can swim across the lake, or that I just need my running shoes or my bike to go anywhere I want without depending on anybody or anything. I love feeling in great shape, feeling that my body can do anything I tell it to do. Second, I enjoy sharing experiences with the triathlon community. Triathlon is not just a hobby. It is a sport you need to really commit to, and we all share this commitment. I have the greatest fun hanging out with people during races or events. The last point is the feeling of pride and satisfaction after successfully finishing a race, and knowing that I could not have gone any faster. I am probably high on endorphins at this point, but it is the greatest feeling ever! What advice would you give to your fellow teammates, who may have lost the drive to continue on with the sport? First of all, pick a race and a challenging objective. For instance, finish a race in a certain time, or qualify for a race. Then determine a training timeline and rigorous schedule. Those have to challenge your everyday life too. I think the motivation will come naturally if you follow those steps. Other piece of advice: be more involved in the triathlon community. Hang out with teammates, volunteer in events… I know this is a great source of motivation for me. What was your proudest moment as a triathlete that you would like to share with the team? Probably after I finished the Hyannis marathon, but this has to be put into context. I signed up for the race about 5 weeks before, on a whim. I was bored with life, and felt up to a challenge (I had never run a marathon before). Three days later, I slipped on my cleats coming back from a bike ride, and hurt my knee pretty badly. I could not run for three weeks, which only allowed me to run twice within the 10 days before the race. Bret Fortenberry and Stephen Wall went down to Hyannis with me. On our way down there, I told them about my objective to run the marathon in 3h, although I had not been training for a marathon. They laughed at me. They were probably right, since I had really no clue what I was getting into and had never run more than 14 miles. I nonetheless remained optimistic and very determined. So I comfortably ran my first loop in about 1h28', a little slower than my normal 13 mile pace. The second loop was a little tougher because the sole of my feet was burning like hell, but I otherwise felt pretty good. When I got to the finish line, my friends weren't even waiting there, because they were certain I would not make it in 3h. Fair enough, I completed the race in 3h11', but I wish you would have seen their faces when they saw my time! That made me really, really proud. "...and on turbulence in the Inter-Stellar Medium." Funny, I was believed it to be turbulent in the Outer-Stellar Medium. Ah, inner/outer whatever it takes.